Is the city's official publishing advocate guilty of the industry's dirtiest deed? 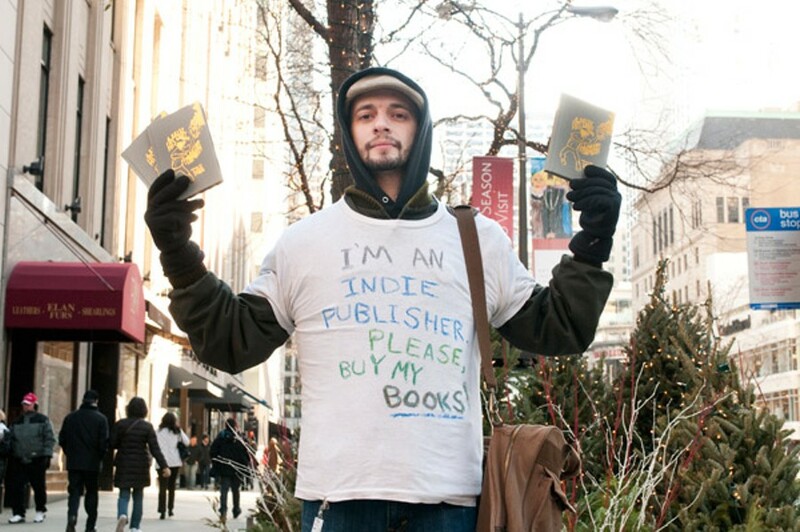 You had to look fast to catch the Chicago Publishes interview with indie publisher Gabriel Levinson earlier this month. The first in a series spotlighting the scrappy independent arm of the business, it went up on the CP website—the city's nerve center and support system for the industry—December 5, and vanished December 7. Levinson himself had it killed, after the unthinkable happened. In the safe harbor of the industry's virtual home, the piece had been censored. Conducted by CP intern Ben van Loon and published in Q&A form, the interview as first posted was fine, Levinson says. It revealed how the 29-year-old inventor and operator of the Book Bike, a low-carbon-footprint distribution scheme for giving books away, had moved on to found a publishing company, Antibookclub, and was now using an equally unconventional strategy to sell them. But when Levinson went back to the website the day after the interview went up, he noticed something odd. A few sentences of impassioned marketing advice had disappeared, along with an important paragraph in which he described struggles he was having with the city while hawking his company's first product on the street. The book, A Brief History of Authoterrorism, is a palm-friendly little hardback collection of eight short stories by the likes of Andrei Codrescu about the extremes to which an author might resort in order to reach an audience. The cover, by Jay Ryan, features a T-shirted terrorist about to toss a flaming book bomb titled Read This. Levinson is editor as well as publisher, and he dug into his own pocket for the roughly ten grand it took to put it together and print 1,000 copies. His marketing plan was direct sales, as in face-to-face contact. On September 9 he ponied up $165 for a city peddler's license, studied which corners are legal for hawking, and began positioning himself on the best of them. It worked pretty well: he told van Loon that 191 of 227 books that had sold so far were purchased on the street, where he was discounting the $24.95 price to as little as $15. That's what he was charging on September 23, at the corner of Michigan and Huron, when a police officer decided he shouldn't be there. Levinson says he knew he was in legal territory, but wasn't carrying the paperwork to prove it. The officer issued a citation with a $200-to-$500 fine per offense and a November 1 hearing date. Levinson says that shut him down for the next month. "It's a battleground out there. The gist of it is that an officer saw me peddling on Michigan Ave., he was misinformed about the law and issued me a citation for selling in a 'prohibited district.' At the hearing, the city dropped their suit due to the 'preponderance of the evidence' in my favor. Unfortunately, I have a feeling it won't be the last time I appear in court over this. I am fast learning that being a peddler in this city is an ongoing fight. Many police seem to be misinformed over peddlers' rights. And the city sets it up like a sting operation: There is this big ol' document of where you can't sell in the city and it's written in directions only. No maps, no complete sentences. If you pay close attention to the document, you'll find that there is virtually nowhere in the city you can peddle. They don't tell you that when you apply and pay for the license. It's something I learned after the fact. This is why it's all-the-more important that I fight for my right to sell in the few places that are ok."
Levinson e-mailed Danielle Chapman, the city's director of publishing and literary programs, to ask what had happened. Chapman responded that the intern, new on the job and "not aware of the editorial regulations," had posted the story before she had seen and approved it. "We are an official City website, and I cannot post anything that comments directly on, or that seems to be taking a specific point of view, on politics or City policy," Chapman wrote. "While I appreciate the chance to feature you, . . . I am not allowed to disseminate your viewpoint." In a phone interview last week, Chapman said she wanted to clarify: the cuts were made not because the city regulates what the website can publish, she said, but because she made "editorial decisions." She took out Levinson's marketing advice because it contained profanity, and she "didn't think a discussion of his court case was appropriate" for the website. "It was a long discussion about peddling," she said: "I did not think that fit." "I cannot" and "I am not allowed" had vanished.